For Catapult, the Open combined a TT event with the Northern Championships and saw the Bill Graham Northern Trophy passed from father to son when Gareth Ede posted a perfect score after discards. Swinging and gusty Northerly winds, Force 4-5, gave a chill to the morning sunshine on Saturday but racing warmed up as day went on. The club runs a choice of 3 courses (notified on the water, setting a memory test failed briefly by at least four Catapult helms at different points) giving a combination of reaches and runs together with the windward leg. Each of the five starts had a port bias, (perhaps to prevent a starboard end pile-ups) but extremely-so for at least two races. This produced interesting tactical decisions--several Sprint 15s successfully started and crossed their fleet on port, but any Catapult starting on port risked becoming a rubber kebab on a starboard A Class. The A�s sliced across the middle of the line on starboard, going for starting speed not line position, so the Catapult choice was to be down the line near them for the port advantage, or competing for the starboard end well above them, with clearer air. Above: the leaders storm the first reach: Stuart Ede leads Paul Ellis and Gareth Ede. In Race 1 around a backwards "P" course, Stuart won the start and led for the first lap with Paul, Gareth and John in close pursuit. Paul took over on the next beat, and Gareth moved up into 2nd. Paul led for lap 2, but Gareth overtook him on the beat of lap 3 and steadily increased his lead to the finish, while Paul and Stuart kept swapping places behind him. On the last lap a luffing dual before the gybe mark gave Stuart a few boat lengths to hang onto 2nd. Meanwhile George pulled up from a back group, past Alastair, to pip John Pep on the line and deprive him of the 4th he had kept all round the course. The wind had strengthened for the afternoon races (both now round an inverted �P� course). For Race 2 Gareth pulled off a risky port tack start and went right up the beat to be just ahead of Paul and then Alastair at the windward mark. Stuart suffered a delayed start with tripped shrouds but began the pull back up. The front two stretched their lead, while further back racing was keen all through the fleet. At the finish, Neal Graneau held 6th as he crossed a few seconds ahead of Alastair, who then had half a boat length over Cliff on the line. Race 3 brought rising gusts and increasing drama. 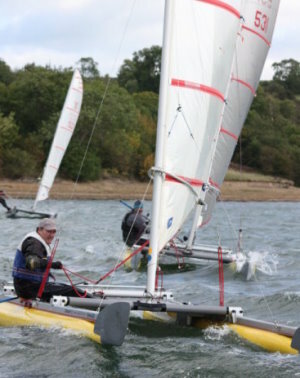 Neal�s capsize in the pre-start (turning turtle quickly) was recovered in a good position with a minute to go. The Catapults going for the port end were correct in theory, but first the A classes forced them up to the line moving slowly, and then as the fleet got away, a big lift benefited the starboard end starters. Gareth and Paul got away, but George again had good upwind speed to join a front pack. 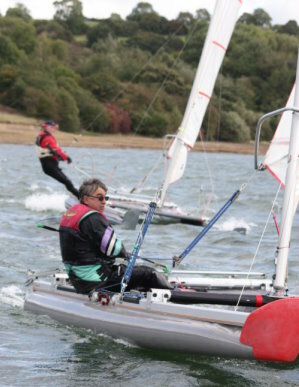 On lap 2, Paul was caught by a gust while adjusting after the gybe mark, capsizing and quickly inverting, so recovery took him out of the race, with Stuart pulling up to second. Cliff Antill, increasingly enjoying the demanding conditions, came through to battle and take George and then was taken back as George moved up to take second. Cliff caught Stuart at the final windward turn and held on for third. Nigel came out of the tight competition at the back to take sixth. On Sunday morning the wind was stronger, Force 5 under a darker and colder sky, and two back-to-back races looked demanding, and somewhat lacking in joy, unless you were Cliff looking to race again in strong breezes. For Race 4, Gareth got away well and stretched out, to be at the first mark ahead of Paul and Alastair. Cliff showed the advantages of sailing in his comfort zone, and captured third, and these places held to the end, the front three comfortably ahead but not pulling away. 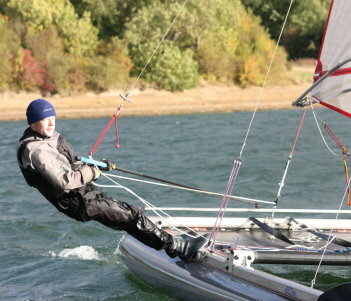 George again pulled up on the wind, exchanging places with Alastair, who gained from trapezing upwind in the stronger gusts, but was not holding George off wind. The issue was decided by George trying to tack inside Alastair�s top mark rounding, sliding down onto the mark. Although he again gained, the 360' gave just enough slack for Alastair to hold fourth. Race 5 started with a shambles, when the boats idling up to the start had last minute collisions from astern, as the next group were in turn pushed up from boats arriving fast at the back. Paul extricated himself for a good start and stretched out well ahead. Gareth began a long chase from a late start picking his way around the carnage and went right into clean air to be pressing Paul. Cliff was quickly underway after a sporting 360� and joined Gareth chasing the front slot. With the wind down a bit, trapezing was now marginal, also affected by fatigue. George again got good speed behind the three leaders not trapeziing. 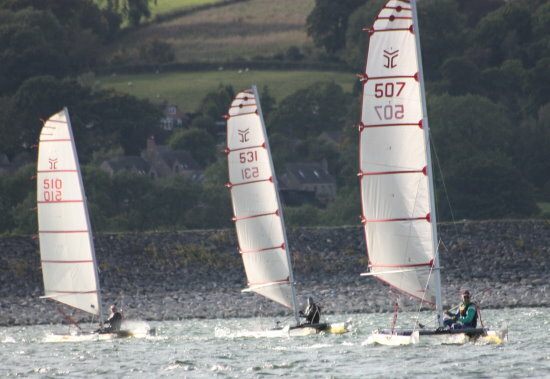 On lap three, Stuart realised that the wind had shifted left (the gate barely able to be got through on starboard) and tacked onto port up the middle, with a big gain over the boats still going across the lake but George was just able to cover him and hold third. This time, the fleet spread out widely, Paul and Gareth contesting the front back and forth until Paul narrowly took the first to block Gareth from a fifth win and a perfect score line.